It now seems pretty clear that WWE is building towards a Brock Lesnar vs. Goldberg rematch at WrestleMania 33, which brings up an interesting question: who will Shane McMahon be in the ring with when WWE heads to Orlando next spring? Originally, WWE was planning a Shane McMahon vs. Brock Lesnar match for next spring’s big show. They began the angle back at SummerSlam in August, when Lesnar laid out Shane after he destroyed Randy Orton in the show’s main event. But, thanks to the success of Goldberg’s return, we probably won’t see Lesnar vs. Shane at WrestleMania 33. WWE is still interested in having Shane McMahon wrestle on their big shows, as they believe that he is one of the biggest stars they have. Why do they believe that? Well, because his match with The Undertaker at this past year’s WrestleMania 32 was the show’s true main event, as it drew the most interest from casual fans. So, even though he won’t take on Lesnar in Orlando, he’ll likely still have a match. As previously mentioned, many are wondering who Shane McMahon will be in the ring with next spring, and the answer to that question is former WWE World Heavyweight Champion Dean Ambrose. On last week’s SmackDown, WWE slowly began building tension between Ambrose and Shane. Of course, as of this writing, Ambrose is scheduled to take on AJ Styles for the WWE World Heavyweight Championship at the TLC: Tables, Ladders, and Chairs show. So, while tension is building between the SmackDown commissioner and the former champ, nothing big will happen until after Ambrose’ feud with AJ Styles has concluded. It looked like Shane McMahon was badly injured at the Survivor Series show on November 20. Some believed that he suffered a concussion after his mid-air collision with the United States Champion Roman Reigns, and while there’s been no official word on the status of Shane, or whether or not he did suffer a concussion, it doesn’t look like he’ll be returning to the ring until WrestleMania 33. While appearing on the Live Audio Wrestling Podcast, Dave Meltzer of the Wrestling Observer Newsletter said that another possible opponent for Shane McMahon at WrestleMania 33 is Triple H. Of course, it does look like WWE is building towards Triple H vs. Seth Rollins, but, who knows? Maybe they’ll decide to go with a match between the brother-in-laws. Also during his appearance on the Live Audio Wrestling Podcast, Meltzer said that WWE could be heading towards a Dean Ambrose vs. James Ellsworth match at some point. Of course, an Ambrose vs. Ellsworth match probably isn’t something that’s “WrestleMania worthy,” so if they are planning on doing that match, they’ll probably do it shortly after the TLC show this coming Sunday night. If Ambrose doesn’t end up as the WWE World Heavyweight Champion after this Sunday’s show, which he presumably won’t, there really isn’t anyone on the SmackDown roster that would be a good opponent for him at WrestleMania 33, unless they bring someone like Samoa Joe or Shinsuke Nakamura up from NXT. So, all signs seem to be pointing towards a Shane McMahon vs. Dean Ambrose match at WrestleMania 33. Does this mean that Ambrose will turn heel at some point before next spring? That remains to be seen, but an Ambrose heel turn has been talked about for several months now. In fact, it was rumored that he was going to turn heel before WrestleMania 32, but the rumor never turned out to be true, although WWE did consider it before they booked him against Brock Lesnar. 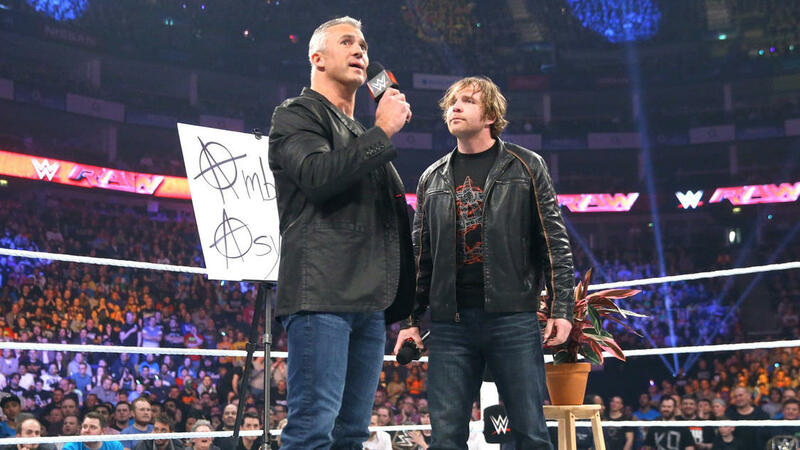 We’ll likely see more tension between Shane McMahon and Dean Ambrose on Tuesday’s SmackDown, but, as previously mentioned, don’t expect it to boil over until early 2017.